Poet, published works 1937, 1939, 1951. 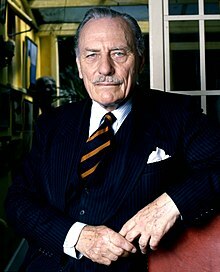 John Enoch Powell, MBE (16 June 1912 – 8 February 1998) was a British politician in the Conservative Party. Powell was born on June 16, 1912 in Birmingham, England and raised there. He studied at Trinity College, Cambridge and at School of Oriental and African Studies. Before becoming a politician, Powell was a professor of Ancient Greek at Sydney University, Australia. When World War II, started he joined the British Army in 1939 as a private but, by 1945, had been promoted to Brigadier. He was elected to the House of Commons in 1950, and was a government minister in 1957-1958 and again between 1960 and 1963. He made a speech in 1968 in which he said that if the United Kingdom let too many immigrants live there, there would be fighting in the streets. In 1974 he left the Conservative Party before the February election, and became an MP in Northern Ireland for the Ulster Unionist Party in October 1974. Powell was married to Pamela Wilson from 1952 until his death in 1998. They had two daughters. Powell was diagnosed with Parkinson's disease in 1992. He died on February 8, 1998 in London, England from the illness, aged 85. He is buried at Warwick Cemetery, Warwick, Warwickshire, England. ↑ Stacey, Tom (1970). Immigration and Enoch Powell. London. OCLC 151226. ↑ "Obituary of Enoch Powell". The Daily Telegraph. London. 9 February 1998.